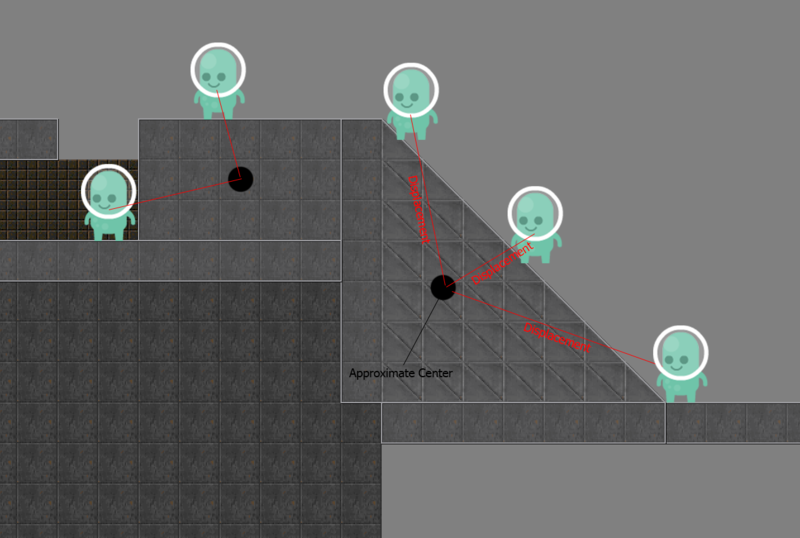 In working on my 2D side-scroller game, one big part of work came from collision handling. I felt a tile-based approach was inefficient and archaic (and rather unsuitable in any case), so I went with a polygon collision system using the Separating Axis Theorem. You can find specific details of the implementation/idea here at metanet software. In short, you project each vertex of two polygonal shapes onto each perpendicular axis of one shape, then you test for overlap. If the shapes do not overlap on ALL axes, then the shapes cannot be intersecting (and thus are not colliding). This implementation is pretty straightforward, and is explained in a lot of places on the net. What does not seem to be explained, however, is how to resolve the collision after one has been found. While this varies from situation to situation, my focus was on player-to-world collision, which meant leaving the world still and moving the player out of the world’s geometry whenever a collision was made. This is actually simple enough to do if you are already using SAT; just store the overlap value and which axis it occurred on, and correct by the smallest amount of overlap so that you will be pushed correctly out of the object. this would tell us if the correction (or ‘push’) vector and the world polygon were in the same direction. We don’t want that; it would push our player further into the world geometry, instead of away from it (and ultimately, with enough corrections, could push us through the other side, or get stuck in an infinite loop in some cases). If the displacement is less than 0, we flip the correction axis to fix this. As you can see, on the slope, the displacements are all over the map! At the bottom of the slope, he’s to the right and below, at the middle he’s above and to the right, and near the top, he’s to the left and above! This causes the displacement to flip the correction vector incorrectly in about half the positions on the slope, not to mention it totally screws up with ceiling slopes; the player’s push direction is completely wrong if we cannot tell that the player is coming at the slope from below! Compare this to the two players on the left near the rectangular object; the displacement is always correct because there can only be a single general direction for the player to be relative to the polygon. The answer is with a sort of trick, something that actual physics engines would implement on a full scale, and that is to calculate a sort of normal direction (a unit vector with a length of 1, indicating as such a direction) for the polygon surface. Now obviously it’s not a true normal; we are not calculating in 3D and therefore are not making use of tangent space (although maybe my terminology is wrong, so forgive me). And that’s it! Using a sort of “fake” normal (while very approximate, good enough), we can tell which side and where the player is relative to the polygon, and this gives us enough information to know if we should flip the correction vector or not! Yep, I’m still here. More than 2 years since my last post…yikes! I’ve gone through and cleaned up all the spam users and such, and upgraded all the site’s backend software. More posts will come sometime soon as I do have plenty of things to talk about. EDIT: And I have now also enabled CAPTCHA for registration. Should put an end to all those spam accounts coming up. The news is a bit late. I’ve been really busy and haven’t had much time to write any more articles for this blog. But now that there is a slight lull, there will be a few new articles posted up within the coming days. To start things off, the WhoDunIt Mod for Zandronum, a Doom source port I may have mentioned previously, won a Cacoward over at doomworld.com. Doomworld is frequently sited as one of the biggest networks for Doom news, and includes a mirror of the /idgames archive, a massive library of released Doom mods and levels. Each year, on Doom’s birthday (that being December 10th), a panel of folks review nominated mods released within the year and select the 10 best releases for awards, with several miscellaneous awards given out for best multiplayer, etc. Winning a cacoward can be sited as a great achievement worthy of some bragging rights. That’s not an excerpt from a (rather bad) mystery novel. That’s a description of actual gameplay from WhoDunIt, a brilliant new gameplay mode for Zandronum (formerly Skulltag) centering around deception and paranoia. It’s a simple enough concept: each round, one person is secretly declared the Murderer, and it’s their job to silently kill off the other players while remaining undetected. What really makes the gameplay shine, though, is the chaos that often results from the “innocents”. The beautiful film-noir-esque maps are littered with improvised weapons and the occasional firearm, as a means for innocents to defend themselves… in theory, that is. In practice, a “suspicious” act by an innocent can find him slain at the hands of his fellow non-murderers, a deed which does not go unpunished. Matches often slide in the murderer’s favor in such a manner, with the evildoer himself rarely getting his hands dirty. Now, who’s the real monster? This sort of tension is unlike anything I’ve ever played. I’ve fond memories of hiding in dark shadows on a server somewhere, huddled behind my knife, silently gazing onward as rampant paranoia claims yet another victim. It’s not often you find a gameplay conversion of this scale turning out so well, even moreso in a multiplayer setting. As such, even in the face of solid CTF sets like Velocity CTF X and 32in14-12, WhoDunIt takes the crown in my eyes. You can read the full cacowards article here. The awards came late this year due to some circumstances, instead arriving on Christmas. Quite the Christmas present, I’ll say! Sometimes it is taken for granted that we have high-level programming languages, and all our fancy, thousand-line catastrophes are happily fed through a compiler that reads and interprets the information, then spits out byte code that only a computer could understand as its final form. The thing is, by understanding how to do such a thing yourself (at least, in a sense of it), you become a better and more knowledgeable programmer. Understanding how to make your own compiler and/or interpreter in the programming language of your choice is also critical for a game developer. An interpreter allows the creation of external resources without having to outsource the tools or use existing stuff. While it’s always a good idea to use the things others have made (for example, libraries; why write your own when someone has already done it, and possibly better? ), making your own interpreter gives you insight into how one works, and besides, without your own interpreter it may be difficult to adjust it to read the input that you are designing! std::string GetToken();		// This reads in a "token"
So, with this in mind, what happens next? Well, you use the parser to read in the original example, and if you were to implement some debug logging or use something like the MSVC debugger and slowly step through the program, what you’d do is check until the token reads a specific keyword, and then make sure the next token is an “=” sign, and then set your variable to the next token read. You can obviously implement your own type-safe checking with this if you please. Remember that this sample is extremely bare bones. It’s best to make your parser able to interpret many different kinds of data types, allow dynamic navigation of tokens and the storage space, and many other robust features that can be implemented. But this example should give those new to writing such a piece of a program a general idea of what they need to do for it to start working. Hope you enjoyed this little article, feel free to comment on it if you have something to mention! Anyway, so my Dad asked me to make for him a cross-platform GUI-based application that can generate password strings randomly with various customization options and capabilities. I was to use C/C++, and I knew exactly what I wanted to do and how to do it, the only thing I needed to take my time on was the actual GUI. It turns out, this will likely be a bigger task than making the actual program. I thought I had some reasonable experience with wxWidgets. Afterall, I had started working with it for a project of mine and it was going rather smoothly. But then, as I found, doing some of the more advanced stuff is…not on the easy side. The steps involved to getting what I want were proving to be quite long and tedious, and on top of that it would eventually turn your code into a massive, ugly, hard to read mess. So, I set out to look for some other GUI libraries. Below, I’ll talk about the 3 most popular I’ve found; wxWidgets (as already mentioned), MFC, and Qt. This is fine and all, but in practice is becomes quite a mess. The fact that almost NONE of the other functions refer to each other through pointers or other forms of memory access, and instead rely on an unsigned int “ID” system (which ultimately forces you to write GIANT enum blocks to provide any form of sanity to it), and you have yourself a lot of illegible code and extra typing for very little result. MFC pulls this same garbage, but fortunately MFC will automatically use the ANSI or Unicode versions of their functions if you use a single, simple define (unlike wx which requires you to prefix EVERY. SINGLE. STRING. with a special conversion Macro–which is “_T(<String>)”). Coupled with pretty poor documentation and confusing layouts, and you have wx: a big pain in the behind. Qt was a relatively new discovery for me. I found this gem while googling around for some information on other GUI libraries. Qt is nice, but has some drawbacks that make me…not want to use it. It is fully Unicode compliant, it is pretty easy to work with, it has a form designer (think the MFC/Visual Basic form designer), it’s fast, and uses a unique idea for running a GUI via a “slot/responder” system (the exact details are a bit sketchy; I’ve only read some basic information about it but it seems pretty effective at preventing errors and remaining typesafe at the least). So what is the catch? Well, for one, the form designer is limited to only the most basic applications (which is somewhat expected, but I think MFC’s designer could at least do some relatively large-scale applications). Qt’s designer also has a different learning curve compared to other form designers (though not nearly as bad the wx form designer…don’t even bother with it). But the biggest thing that turned me away was that the Qt GUI code is spit out in it’s own language! 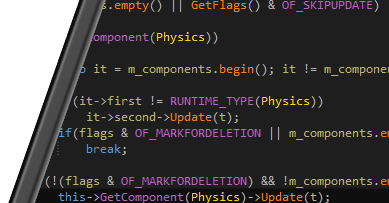 Not straight C++ or anything, but in it’s own proprietary language. Ultimately, the compiler converts the input code into a C++ form, which if what I remember what I read correctly, can be spit into source files for someone to edit, but the thing is that you have to take an extra step just to do so! So essentially you have to design your application entirely in Qt first (either by hand typing the code or by using the form designer), compile it, and then and only then can you make any “tweaks” to it from the Cpp sources. This is unfortunate, because it sounds awesome, but that extra bit of steps just ruins it for me at least. So far it seems that there aren’t any feasible, simple GUI libraries that don’t require extra work or overhead to create an application. SO WHAT IS THE SOLUTION TO THAT? You either write your own (good luck with that), OR write a wrapper for an existing one so that it’s NOT as painful to work with. Hence, I’ll likely be writing my own wrapper for wx, since it’s cross-platform and works in native C++, two points it has over MFC and Qt, respectively. I’ll have to figure some way around that God-awful Unicode macro, but I’m sure a solution will be available. Code Does Not Control Everything….Mostly. There was a discussion on /r/battlefield3 some time ago when the latest tentative changelog was announced. The talk was related to 3rd person player animations and how they sync up with what is happening in first person. In short, the focus was on the reload animations; anyone who has played Battlefield 3 can tell you that the reload animations in first person don’t match up well with the 3rd person animation, often leading to silly situations where a player is firing their gun while reloading it at the same time. “it can’t be done” = don’t have the time/allocated resources to re write the code. The thing is, programming and code have very little to do with an actual animation done by a mesh of shapes, polygons, and skeletal bones. At best, programming can control the speed and timing of an animation. It can control how and which bones react, but they can only perform the actions they’ve been assigned. So in the instance of the reload animation talk, the best the DICE developers could do is speed up the animation or cut it off midway through. Both solutions would look wrong, and the proper thing to do is redesign the whole animation.But that is a time-consuming process. Rewriting some stuff in code is not. If they had the option to do it, they probably would have, but it isn’t as simple as changing some values, it’s actual reworking of a model and animations. On top of that, each reload animation for every single weapon would have to be redone. Hopefully you can see how this would eat up a lot of time very quickly at this point…. Valve software has put out some impressive technology in their Source engine. One of the most profound parts are the animation systems. There is a particular tool in the Source SDK, a set of programs available through Steam which allows for Source game/engine modding, which allows you to animate an NPC’s mouth, facial expressions, and eye movements all through recording a voice clip. Somehow, the software recognizes speech and replicates the mouth movements onto an NPC. Granted, it’s not always 100% accurate and often requires a bit of custom tweaking every few frames, but it does a great job of a baseline at the least. How did they pull this one off? Doesn’t this contradict what I mentioned? Well, indeed. It’s impressive stuff for sure. My best guess is that they have pre-computed facial positions for various sounds made by the human mouth when talking, and then chains them together in a smooth animation by interpreting the audio data. This is in simplest terms, of course, nor do I even know if this is how it really works but it’s the best guess I can make. Just looking through the source files supports this a bit, as ALL talking NPCs have to include some basic skeletons when the model is compiled. Also, have more content to come in the following days. Stay tuned! Alright, now that the site seems to be fully up and running, I’d like to quickly talk about something before I go to sleep, and that is: Users giving feedback with a suggested fix that is often complete nonsense if not entirely ignorant. These comments are fine and all. People are just trying to provide ideas or solutions. But the biggest thing that irks me about such suggestions is the sheer lack of actual knowledge behind most of them. If the solution were as simple as had been mentioned, it would have already been done. Often times, people bring up an idea but have zero background on the subject, and thus what they are stating becomes nothing more than nonsense. For example, DICE’s latest Battlefield iteration, Battlefield 3, has many ways for its users to express their concerns over any bugs, gameplay issues, etc. via the forums (such as on battlelog, the DICE site, and the EA site), the feedback site, reddit, twitter, and more. This is not how it works, folks! An old programming saying goes, “Fix one bug, create two more.” It’s just about impossible for large-scale programs to be entirely bug free, and when you fix existing bugs you potentially end up creating more with your fix. It seems like a vicious circle, but the point is to get the program to a stable enough point that additional bug fixes are not needed. I also find this a bit upsetting when people make posts like that, because then it spreads like a virus; uniformed people believe what they read and then think that it’s truth, which in turn causes more people to get on the developer’s case, stating a proposed solution that actually has no background whatsoever. Whenever I see something like this, I’ll often try to intervene and make a statement or response with a general idea of what may be happening. The goal of the posts isn’t to appear knowledgeable or prove anyone wrong, but to simply provide a correct perspective and shed some light on what they generally do not know much about. This being my first blog post, I think you can expect to see more from me related to explaining some programming or game development-related stuff with a bit of depth. Perhaps a reader can learn something from it, and who knows, I might wind up linking an article for people to see in some posts some time in the near future.